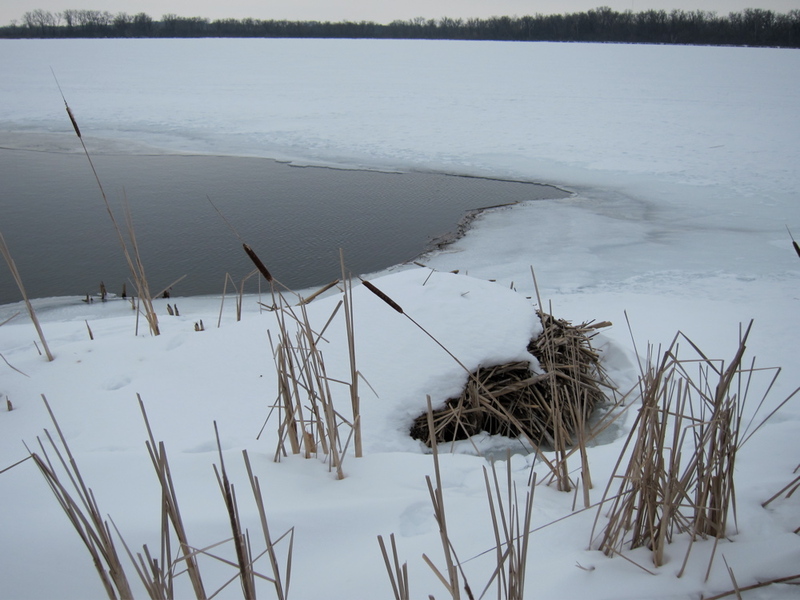 First, let’s answer photo challenge #1: Lake Wingra has open water here because of a spring. New Millennium spring, located near the boardwalk at Edgewood College, appeared in 2000. 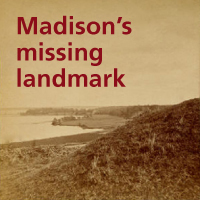 Lake Wingra’s springs may explain why it was at the center of an incredibly dense concentration of effigy mounds. About 8 of the lake’s original 30 springs still flow—reduced groundwater affects spring output. Sharp-eyed viewers of photo #1 may notice an odd shape in the upper right, seen again here. What is this structure? Both photos are from our Lake Wingra slideshow. Send us your answer by next Monday (how to play photo challenge). Later this week we’ll post video of another Wingra spring. Later this week we’ll post audio/video from our Wingra subpolar ice expedition. Until then you can read David Thompson’s expedition report (ignore the embarrassing photo). 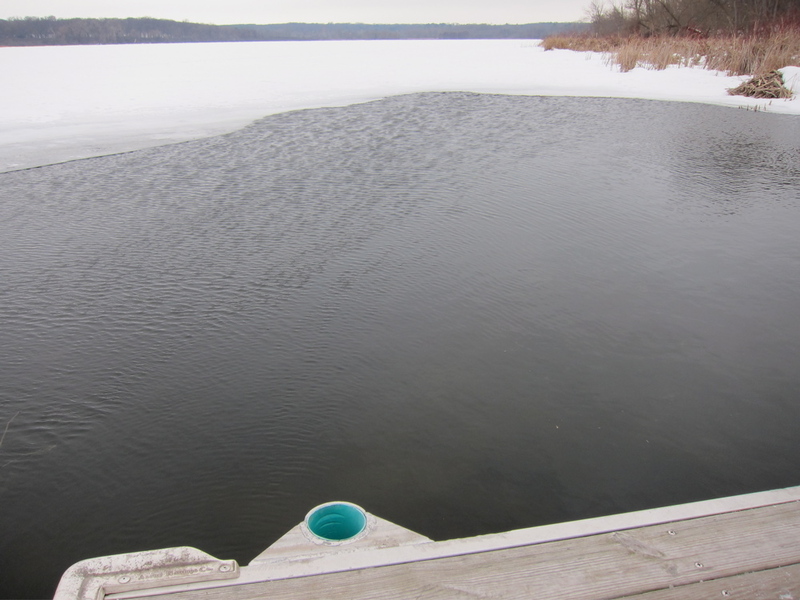 Our first photo challenge of the week asks: Why is there open water on this Madison lake in late January? Send your answer and visit every Monday for a new photo. To get news of Unseen Madison posts, follow Jeff on Twitter. :: Weekly winners can receive a photo postcard, such as this. :: Winning 4 photo challenges gets you our usual great prize: either a book (TBD) or 2 hours in the field with Gordon and Jeff. :: If we receive multiple correct answers, Terrence the Unseen Madison cat holds a random drawing to decide a winner. 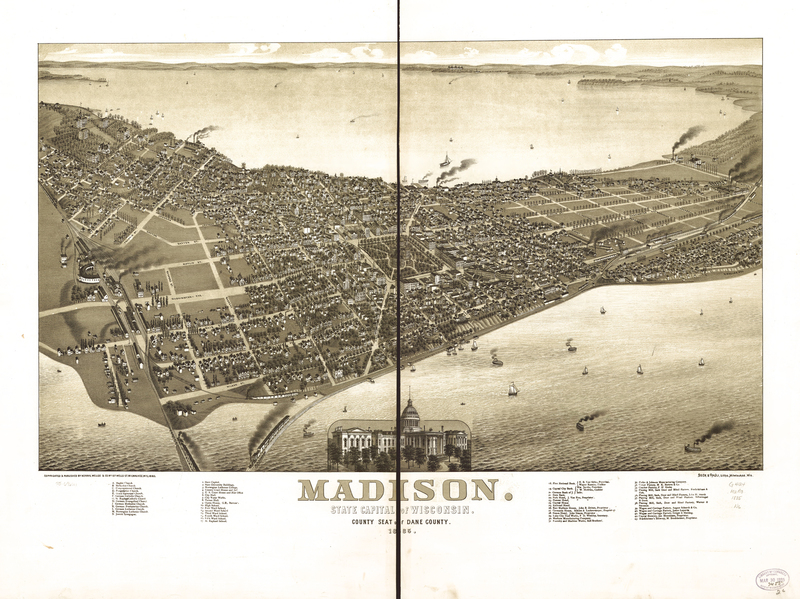 Milwaukee lithographers Beck & Pauli produced this Madison view in 1885.